Do You Have a "Normalcy Bias"? Of course you do! We all do. We want everything to stay the same. We want to go on working our jobs, raising our families, watching the our favorite football team win, and taking a vacation now and then. But believing that things will never change is a form of delusion that is totally irrational; however, it is necessary for our survival. Our brains won't actually let us believe that a disaster can happen — not to us! The world is a mess! I know you've noticed — like I have. You read. You watch TV. You've heard or read the scary stuff from the talking heads. But most of us are stuck in "willful blindness", a "normalcy bias" — meaning that we refuse to believe what's right in front of us. It's time to force our rational minds to pay attention to what's happening around the world. You've seen the news. 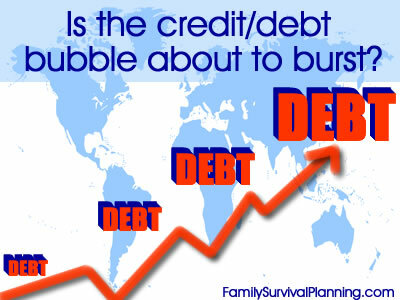 What seems to be going on is a debt bubble, a credit bubble, and a stock market bubble — all may crash at once. I'm not a financial expert but there seem to be too many "warnings" circulating right now. And I hate predictions and scare tactics, but it seems like a good time for all of us to sit up and pay attention. Many unusual things are happening in the area of global finances, like never before, because we are so globally connected. We don't get warnings for earthquakes, floods, or getting fired from a job. But I consider what's happening worldwide right now as huge warnings. The stock markets see-saw, but we can't predict a REAL crash. We may be in for the biggest economic depression this country has ever known — or not. America, Europe and Japan all suffer from the same problems... and are applying the same solutions: trying to "buy" their way out with more debt, with their central banks adding to the problem. We just don't know what will happen since we're in new territory that's different than our historical evidence. We have never been in this situation before. Never have so many people depended on so much credit. Never has the world had so much debt. So how do we prepare? Preparing for any disaster is just plain prudent and sane. If things go from bad to worse in the financial markets, there are tried and true preparations needed, as with any crisis. But these should be your most immediate tasks. Take CASH out of your bank. Go to your bank and take out cash to stash somewhere in your home where it's readily available. In a financial crash or depression, "cash is king". The government can at any time give our bank accounts a "haircut" as happened in the Cyprus "bail in" in 2013. Depositors lost 47.5% of their savings. Forget the FDIC guarantee — they can't possibly cover all the deposits in all the banks. There is only $250 Billion in ACTUAL cash (paper money) available worldwide. Or the banks could just shut down as happened in Greece. "Bank holidays" they are called (great euphemism). Stock up on supplies. If you have been lagging on acquiring supplies, go to your nearest wholesale store or grocery and buy cases of food and toilet paper. Or order freeze dried and dehydrated foods by the bucket. Fill up your gas tank. And while you're at it, fill up some extra gas cans. In an economic collapse, gas could be scarce or very expensive if supply lines are interrupted. Be prepared for possible civil unrest. We have seen lately what civil unrest looks like. The reasons may have not be economic, but what do you think will happen to those unprepared people when there is no more food in the stores or we can't buy anything with a credit card — cash only. The New Economic Disorder will help you understand what's really going on in our economy and how to prepare. The coming new world order and what it has to do with your finances. The Prepper's Blueprint is a step-by-step easy-to-follow plan to help us get prepared as quickly as possible. It includes common sense concepts and plenty of supply lists. It's divided the chapters into what the author calls "layers of preparedness". Each layer will help you progress from "beginner" to "longer term" to "the end of the world as we know it". Layer 2: Chapters 15-31 help you to get ready for disasters that turn out to be much longer-lasting: economic collapse, long term power outages, and pandemics, to name a few. Layer 3: Chapters 32-56 prepares you for the long haul and a complete change of lifestyle, the end of the world as we know it: providing food and water once supplies run out, security, retreat properties, and long-term plans. The goal of this very readable book is to help you along the path to self-reliance, and ultimately, to get you and your family to a point where you can not only survive, but thrive, in a world that may be permanently altered. The Prepper's Water Survival Guide is a must read book. If you think you know everything there is to know about storing water . . . well, reading this book may change your mind. I have plenty of water stored but I learned a few things from this book. In addition to harvesting water, you’ll gain the tools to keep large stores untainted for long periods of time, test the water you collect for dangerous toxins, and treat water-related illnesses that are commonly contracted during a disaster. Are you and your family prepared to be self-reliant? Will you be able to let go of your normalcy bias and provide for them and keep them safe? The best way to prepare for the future is to acquire knowledge and skills that will best equip you to handle the unexpected. However, it doesn't matter how prepared you are for disaster, if you run out of food you will soon run out of time. So stock up NOW! Three "must have" funds to ensure financial security. Do you have enough "food insurance"?